Blue scraps for January sounds about right. Christmas is done and we are back to the same old same cold. We have had a cold week. Some snow and some bad roads. Blue and icy all around. I also kind of slid into the ditch today. Me and my van are fine, thanks to the nice man who towed me out. Last year I got doing the 6" sampler blocks. At first I used what ever lights. Then I got using lights that were the right colour of the month. I did not like the 4 blocks on the right. So this week I remade the 4 blocks on the left to make up my 9 sampler blocks. Here is the 9 blocks. 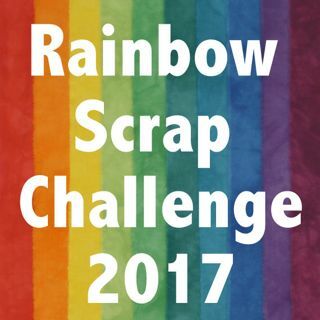 I have added this to Socrappy's Rainbow Scrap Challenge 2015. There the blue blocks are all fixed up. I have many other blocks to do in many other colours so the sampler will be at least a 2 year project. Today I worked on these little Lime Green Dear Jane blocks. 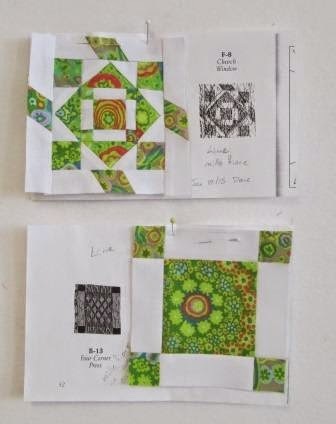 I work on the RSC 2015 (Rainbow Scrap Challenge 2015) I may find I need to finish a few quilts and not start new blocks. So I will plan to work on a quilt that has some of the months colour. So maybe some blocks but I must finish more. I have too many to list today. I will keep making Dear Jane blocks with Kaffet Fasset fabrics. I have a quilt to finish that is a joint quilt with my mom. We need to finish it. 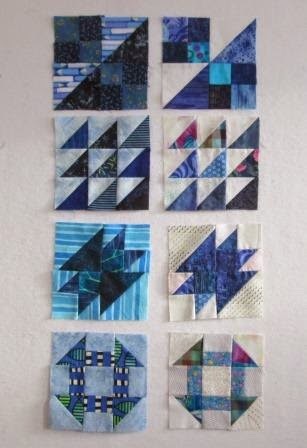 I hope to finish the log cabin quilt with Kaffet Fassets that was part of a block exchange. 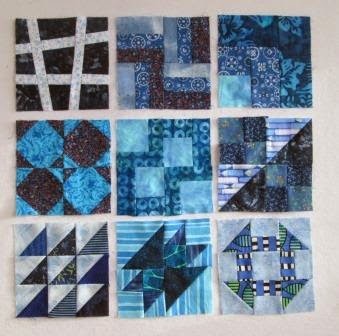 I have some blocks from the Leduc Guild tin box exchange I hope to do a table runner with. I have a Scrap Garden challenge to do for the Leduc Guild past president challenge. I think I have all the blocks done. Maybe I should get at least 1 or 2 of the Bonnie Hunter Mystery quilts done. Easy Street is a top waiting to be quilted, 3 others in block form need to be made into tops then quilted. Hope your quilty goals come true and you enjoy working on all of them! Love the Dear Jane blocks in lime! Sounds like lots of great plans for the new year. Love your blue blocks. I like the ones on the right as well as the left, but more blocks made is more scraps used up, so it all works out in the end. That is quite a list! I am trying to get some finishes this year around a few new projects. I think I need more time in my day to get everything done (or maybe stop starting new things?). Love the blue sampler blocks and those tiny DJ's. Looks great Cathy. I do like the remake using blues as backgrounds. Good call. I see a Kaffe Fassett addiction here. Aren't his fabrics absolutely brilliant. Great blocks.